If I ever mention anything about Fully Charged on Twitter I immediately get asked about Carpool. If I ever mention my science fiction books on Twitter I immediately get asked about Red Dwarf. There is nothing I can currently say about Red Dwarf. But seeing as I produce Carpool myself I can say what the hell I like. 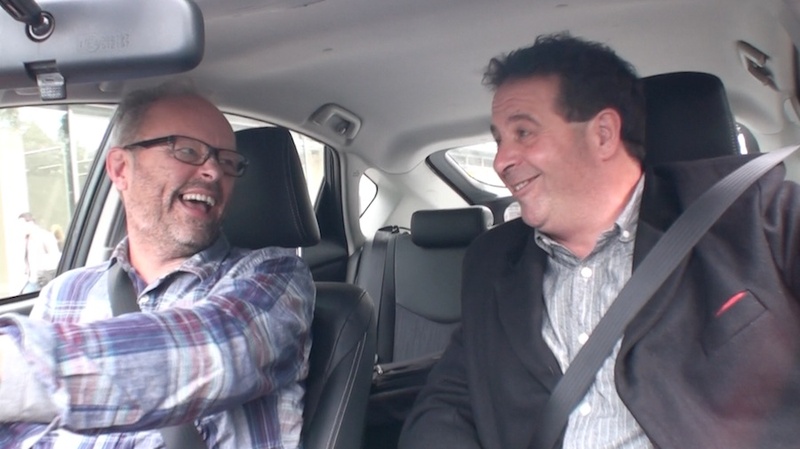 This picture is a still from a recently recorded Carpool I did with the wonderful comedian and political ranter Mark Thomas. You can’t see it yet. When I first started Carpool years ago it was an experiment and bizarrely for me it was an experiment that worked. It was a costly and time consuming experiment but I loved doing it. Eventually (after making 90 episodes on my own) it was commissioned by UKTV and I made a 20 guest series for Dave in the UK. Finally I got paid something for doing the shows. Then I did some other proper work and I didn’t have time to make any more, but the ones I’d made still got 1,000’s of views every day. So why don’t I make more. Two reasons and they are both to do with money. The big one is insurance. My regular car insurance covers myself and my passengers but if there was an accident and the insurance company discovered I had camera equipment in the car, there would very likely be problems. I don’t even want to think about it, 112 episodes recorded and no accidents but it’s a worry. So I used a thing called ‘action car’ insurance which is what they use on film and TV productions. This covers you for specific time periods when you are recording and it’s on top of your regular car insurance. It’s expensive but it means the likes of Stephen Fry and Sir Patrick Stewart are covered for literally tens of millions of pounds. Second is administration. It really isn’t that hard to fir the cameras, pick someone up, drive them somewhere while chatting and drop them off. In fact it’s great fun. It really isn’t that hard to edit the shows, it’s not hard to upload them, all that is a walk in the park. Arranging what time to pick them up and from where and on what day is incredibly time consuming, complicated and takes the skills of someone who can organise things really efficiently. Every Carpool episode I did took about 15 e-mails, 3 phone calls and a couple of days of stressing about with diaries. I cannot face that again. Sweet. I could do that. But I would have to pay that person. I don’t have a budget. No really, I don’t have a brass farthing to spare. So, I’ve toyed with Kickstarter campaigns and tip jugs and bitcoin bins, it’s all a bit shonky and anyway, the joy of Carpool was everyone who had a computer could watch it for free. That’s what new media is all about, it’s all about free. The only problem with that brave new media paradigm is pillocks like me working really hard, making shows that are popular and not only not earning anything but actually forking out for cameras, petrol, time, editing, phone bills, electricity bills, the list is dull and long. I have a plan. It’s taking ages but it might just work. Maybe the Carpool monthly e-magazine might be a better description. Cheap, iPad specific, riddled with DRM, not device agnostic, exclusive, elitist, the list goes on. But it would create a small amount of revenue that could go toward the two expenses listed. After a respectable period of time I would eventually put them for free on YouTube, iTunes, Vimeo etc so even if you don’t have an iPad there would be more Carpools.